For the LAUNCH Food team, the past week has been one of discovery. We are in Timor-Leste, a country with striking natural beauty that contrasts sharply against its staggering rates of poverty, undernutrition and stunting. And yet, the name "Timor-Leste" translates from the Tetum language to "East Rising Sun". Since it's 2002 independence, this young nation has seen increased life expectancy, reduced child mortality, boosted school enrollment and reduced illiteracy. We are here to meet with 20 innovators from across the Indo-Pacific region, through innovation growth workshops, lessons in emerging storytelling technologies (like virtual reality, drones and 360° video) and informational sessions on applying our global LAUNCH Food Challenge. LAUNCH Food seeks breakthrough development innovations to improve stagnating nutrition outcomes, which are particularly acute in the Indo-Pacific. Our partners on the LAUNCH Food Challenge include the InnovationXchange at the Australian Government Department of Foreign Affairs and Trade (DFAT). "Malnutrition is crippling our communities," says InnovationXchange assistant director Dave Kelly. "What an incredible gathering of creative thinkers, who are innovating to bring pride back to traditional food, to improve health and prosperity for all." The current LAUNCH Food Challenge seeks innovations to improve healthy food choices. These could include new food products, agriculture services or technologies, or development approaches to improve nutrition outcomes through food. "Healthy food makes healthy people, and that leads to a strong, healthy world," says Filipe Da Costa, advisor to Timor-Leste's President. "This regional workshop has started the foundation for dynamic discussions between Timor-Leste and Pacific nations." In Dili, the LAUNCH team visited the Agora Food Studio, which operates on a mission to improve food intake, by facilitating the consumption of more traditional regional foods and ingredients. There we worked alongside journalism technologist Ben Kreimer to produce virtual reality and 360° videos about eating with the seasons and re-establishing pride in the young country's ancient culinary traditions. 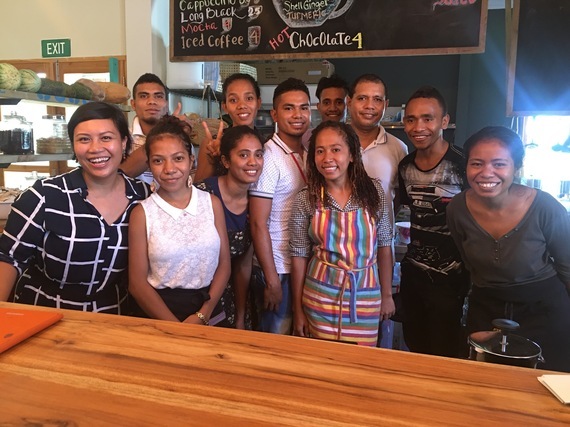 Samoan innovator June Teaurima, founder of Ezibro Juice Bar, hopes to facilitate a healthier lifestyle for the Samoan community, by utilizing local & organic fruit, vegetables and herbs. Teaurima's vision, and the Ezibro Juice Bar model, is inspired by her father, who has suffered from Type 2 Diabetes for more than thirty years. "360° cameras, virtual reality and technology, in general, are things that we, here at EziBro Juice Bar, are excited to utilize in our business model," says Teaurima. "We want to capture the emotion and ambience of our customers, to show the heart of our work." Earlier this week, the LAUNCH Food team drove up the steep foothills of Baucau, Timor-Leste's second largest city, where we met with women farmers in the remote rural village of Triloca. One of them, 31-year-old Maria Moniz, is expecting her sixth child. In Baucau municipality, where Moniz lives, 52% of children under the age of five suffer from stunted growth. Because Moniz worries about access to nutritious foods, she and a community of women in her village maintain a sustainable farm that provides their families with supplemental sources of nourishment and income. 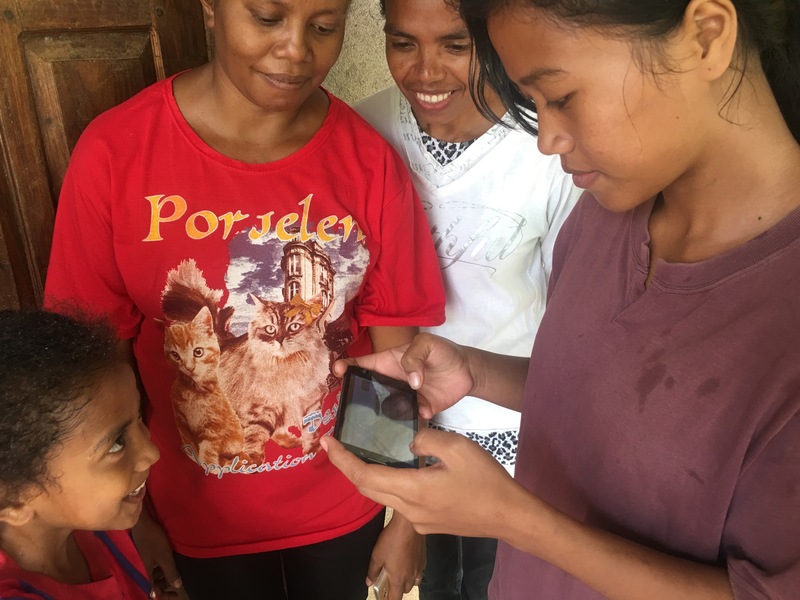 As the LAUNCH team prepared to depart Baucau, one of the female farmers used her smartphone to capture our LAUNCH Facebook information. 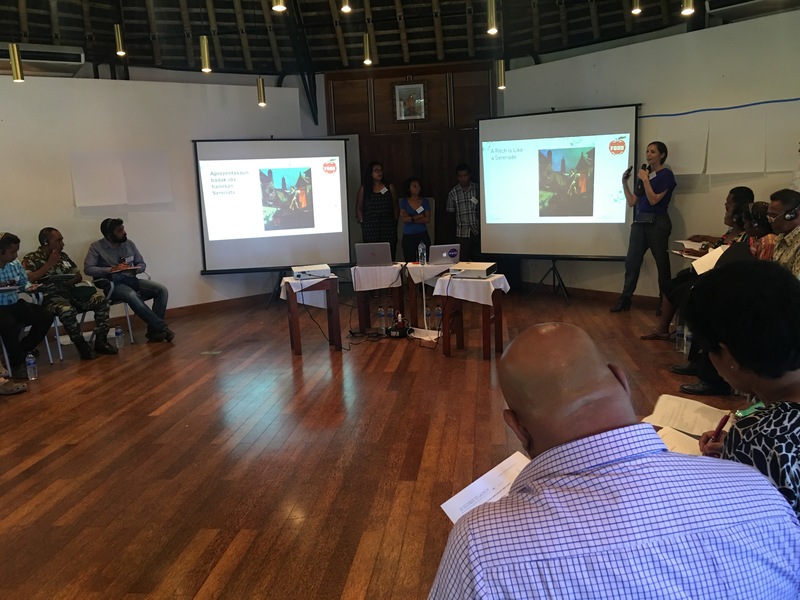 SecondMuse innovation workshop leaders Roxann Stafford and Elyssa Dole shared their own reflections on the LAUNCH Food Challenge and its progress. 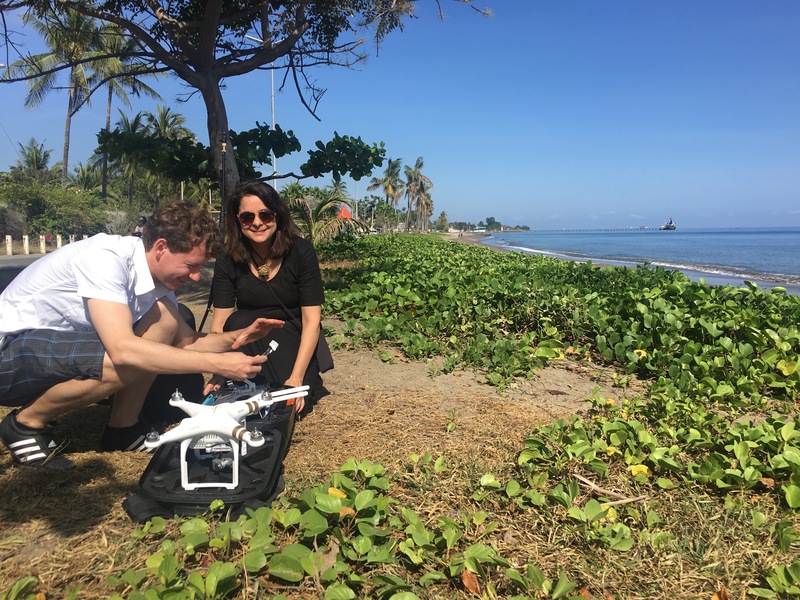 "The passion, creativity and commitment of innovators in the Pacific are not only inspiring, but also critical to achieving healthy outcomes and tackling the challenges we face globally," says Stafford. "The friendships and connections made during our time together show the power of what happens when a devoted group of people come together with a shared purpose grounded in community, respect and trust." Dole echoed Stafford's sentiments, saying, "Doing LAUNCH workshops, like these, helps to create a shared understanding of innovation and define practical processes that can make impact possible, for all of us." 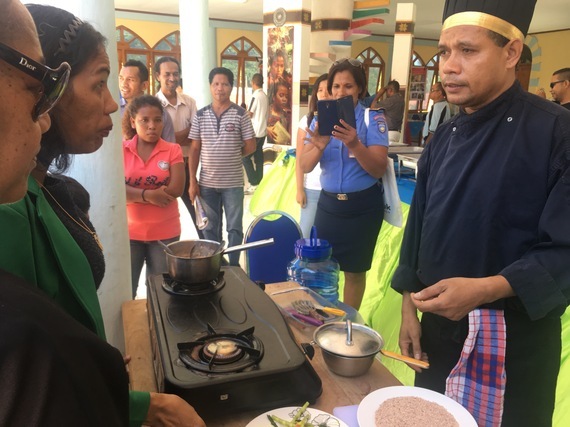 Photo: Celebrity chef Cesar demonstrates modern ways to prepare traditional Timor-Leste cuisine. Entrepreneur Bob Pollard works with Kokonut Pacific in the Solomon Islands to support coconut farmers' production of more than 200 tons of virgin coconut oil. "It's been interesting to learn from others, and exciting to understand, that this conversation can go so far because of social media," says Pollard. 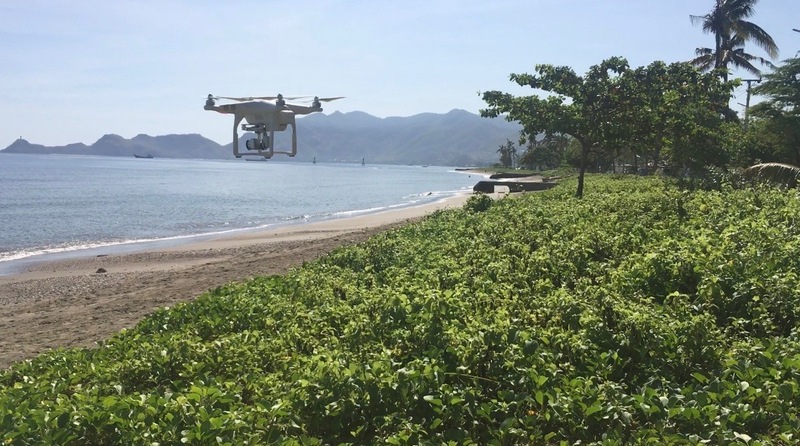 "The story of our coconut farmers and their oil needs to be told." Some participants will head back to Dili before returning to their respective countries, including Tonga, Paupa New Guinea, Fiji and Samoa. Many expressed how a regional and global approach and opportunities to work with the private sector through the LAUNCH network could help intensify and expand investments in agricultural innovation and food technology, to meet the immense challenges caused by malnutrition. 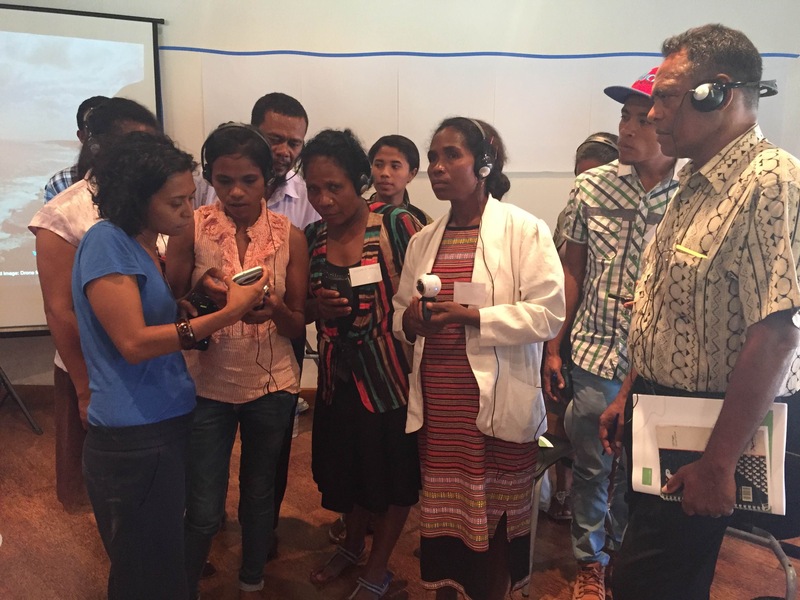 According to Heather Grieve, nutrition advisor to the Timor-Leste President, "The entire experience of bringing sectors, within Timor and across the region, together to capitalize on creative solutions, prevent and control malnutrition in vulnerable communities has been epic."